Large Land Mammal: What will *you* be doing when '010 arrives? What will *you* be doing when '010 arrives? There are still a handful of people who remember Guilty Pleasures' origin, back in what we lovingly (or wistfully or hungoveredly) refer to as "the Slow Bar days." Once more, back into the archives, for a look at what has turned into a Nashville New Year's Eve tradition (for which you can snag tickets by clicking here). But back then, it was usually just a sweaty, loud, packed trip down a more recent memory lane. It always looks different in the daytime. Especially when you were there last night till late-thirty, riding high on the after-effects of a packed, sweaty house that was rockin' all night, what with it being Guilty Pleasures' ''Rock Night'' and all. But the rag-tag, fugitive, fleet-fingered members of Nashville's greatest loosely configured '70s and '80s cover band are back at it again this fall afternoon. There may be football on the TV over the bar, but there's also Trisha Brantley's ''big book of lyrics,'' and there are songs to be learned. ''We got it, man!'' exclaims Slow Bar proprietor/Guilty Pleasures guitarist Mike Grimes as I walk in the door. He's not talking to me, though; he's encouraged by the fact that their rendition of Heart's Alone, featuring Jocelyn Taylor and Brantley on vocals, has come together so quickly. Tonight, Grimes notes later, is ''Chick Night,'' with a power ballad-heavy rundown destined to bring out the Benatar-lovin' best from band and crowd alike. After a verse and chorus, the band has the instrumental rudiments down; now it's just a case of locking in the harmonies, which, on a Heart song, ain't an easy task. Keyboardist John Deaderick is pretty much warbling as high as his lanky frame will let him, and Jocelyn is trying to find the right place for her rich soprano. Brantley is the utility infielder, cracking the whip to keep the rehearsal flowing, shuffling around the reams of paper that make up the Guilty Pleasures ''songbook,'' and even providing some last-minute stage attire for horn guy/singer Tommy Keenum from her vintage clothing enterprise, The Hip Zipper. Right now, though, she's waiting for Jocelyn to find her vocal comfort place, which is where she'll jump in for the harmony part. ''You pick a note and I'll follow you,'' Trisha says, mostly patiently. That's how it goes for a Guilty Pleasures rehearsal. They try to mix up the show as much as possible (save for guitarist Will Kimbrough's spot-on delivery of Journey's Lights, which always kicks off the night), but the experience and versatility of the players lets the singers play around a little bit. Sometimes all it takes is one pass, as it does this day with Kevin Rhoads, a shaven-headed kid who has apparently spent way too much time listening to Vanilla Ice. Rhoads walks in while the band is picking up Annie Lennox's Why, with Marna Taylor wailing away while bassist Daniel Tashian plucks out his part prone on the floor. The band takes a moment to reset, then launches into Ice Ice Baby, for which Rhoads mounts the stage and doesn't miss a word, syllable or Rob Van Winkle vocal nuance. And when the song is over, just like that, he's gone. Sometimes it takes a little experimentation, as with the re-creation of the Phil Collins/Philip Bailey hit Easy Lover. They cycle through four different sets of male vocalists in about 30 seconds before handing the assignment to Tashian and Keenum. With Keenum doubling Bailey's ridiculously high vocal parts, it's agreed this one is better earlier in the night, and tentative set lists are starting to form. And then there are times when it takes just a little more effort to get a song off the ground. Japanese-American folk-rocker Masa needs four runs through My Sharona to get the lyrics down. (''You guys won't know what I'm saying anyway,'' he accurately notes later on.) Kat Martin, Keenum and Jocelyn need a little extra time for the ornate ''choreography'' required for Salt 'N' Pepa's Push It. And, as the band approaches the seventh hour of rehearsal (following an equal amount of rehearsal time plus a nearly four-hour show the night before), the appeal of learning Boys Don't Cry's I Wanna Be A Cowboy is just about nil. Eventually the rehearsal breaks up, but by around 10:30 p.m., when the lights go down in the city and the sun shines on the bay, the crowd wedged into the bar that has become an East Nashville mainstay will have little to no idea that the players on the platform before them have been aiming for this moment since about noon today. The crowd is just there for the music and the memories. 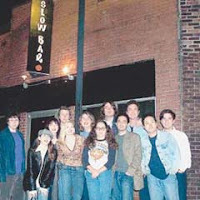 And so are Grimey, Kimbrough, Tashian, Deaderick, Gerhke, Tommy, Marna, Kat, Kim, Masa, Jen, Jocelyn, Jeremy and whoever else ends up on the Slow Bar stage.